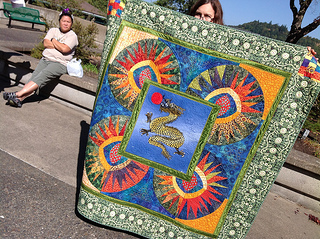 Marika Pineda, Queen Bee at the Lane CC Library, Reference section, shows off The Dragon Quilt, which she made for her brother Kelly Thompson. A whole bunch of us from Aspiring Leaders were gathered outside the Diversity Mural lip-synching and dancing to “Fireworks,” and Marika brought it out to show us between takes. Many were the oohs and ahhhs! This entry was posted in Faculty Stories. Bookmark the permalink. Thank you a bunch for sharing this with all of us you really understand what you are talking about! Bookmarked. i like this post thanks for posting. Get Emoji : Discover emoji names and list of all emojis or get emoji at emoji search engine. Copy and paste emoji for Social Media, App, Website, Smartphone, Tablet, Smart TV, iOS, Android, macOS, Windows, PC with emoji keyboard online.